Repair is serious and troublesome, especially when it comes to replacing the flooring. With a bathroom or kitchen, everything is relatively clear - most people prefer to lay tiles there. But for the room there are a lot of options, one of which is the laying of the laminate coating. 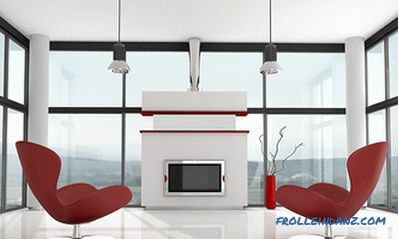 Laminate coating is not only durable, but also durable. It does not require special skills in repair work. Installation of laminate is simple. Any business starts with a plan. The start of the repair is no exception. A work plan and estimate are drawn up, which includes all the costs of acquiring construction material. In this article, you will learn how to calculate the amount of laminate flooring. Before you buy a laminate , it is necessary to clearly know what amount is required per room. 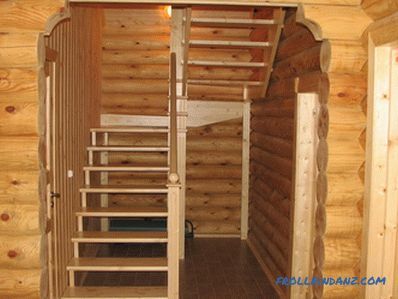 When calculating, it is necessary to take into account not only the features of this type of coating, but also the manufacturer, and the brand, as well as the method of laying the board - diagonally or directly. If you buy less material, it may happen that you will not be able to purchase it, because there will not be such a color of the laminate board in the building supermarket. Repair for this reason may take indefinitely. You can independently calculate the number of boards that will be needed for repair. To do this, use a simple algorithm. How to do it correctly? 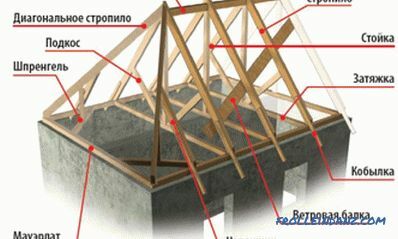 Room drawing is a prerequisite for the calculation of laminate panels, especially if the room is non-standard. Detailed drawing should take into account doorways, indents, pipes, niches and radiators. 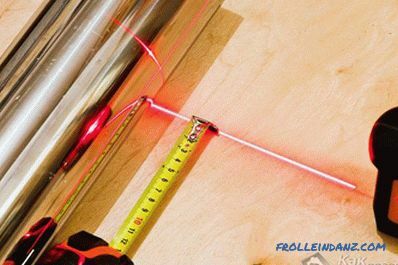 It is only necessary to measure the area of ​​a room by floor. The walls of the room may be uneven, so the measured area will differ from the true floor area. 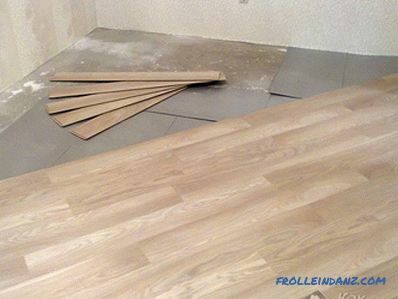 The resulting area of ​​the room should be divided by the area of ​​one laminate board. The result of the calculations is rounded up. To accurately determine the amount of laminate it is not enough to have only a drawing of a room and know its area. Depending on the location of the slats on waste can take from 5 to 10% of the material. Direct Laying of Laminate. With this method, boards are stacked across or along the luminous flux, with the displacement of each subsequent row occurs on 1/3 of the panel. 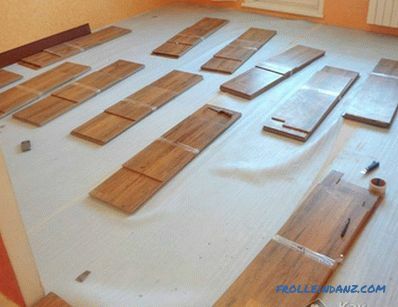 This method is the most economical, since no more than 5% of the laminate panels will go to waste. Diagonal installation of flooring is the most time consuming and uneconomical. More than 20% of the laminate panels will go to waste, but this installation is unusual and very beautiful. Combined method - combines two styling methods: straight and diagonal. Panels are laid along the walls in the direct method, and in the middle diagonally. Very original combination. Costly, but unusually spectacular. The layout of the pattern of laminate boards. With this method of laying the board, the emphasis is on creating an unusual pattern - bright, original and colorful. Therefore, we are not talking about saving. 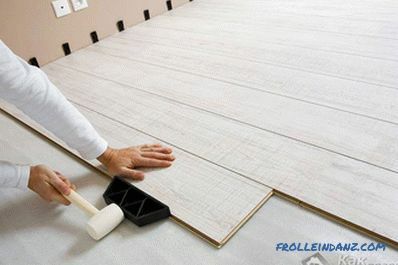 With this method of laying the floor covering will go to waste up to 40% of the laminate coating. Laying laminate herringbone is an unusual way to install a floor covering. Requires special laminate. Determine the total area of ​​the room. 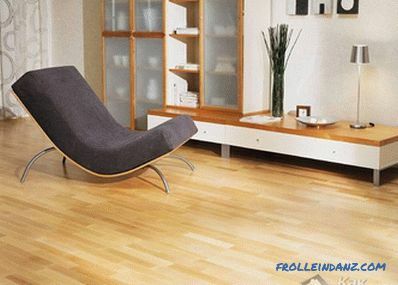 The area of ​​the room is divided by the area of ​​the laminate board, which is indicated on the package. when laying with a pattern - 40%. The resulting calculation result using this method should be rounded up to a whole number. After installing the laminate, there may remain several panels that can be used in case of emergency repairs.